The title of this post comes from a friend of mine. Her Mum is a big fan of the shop Laura Ashley. We used to call it Lovely Laura's Lovely House of Loveliness because we thought it was funny! Anyway, this post isn't about lifestyle shopping it's about the beautiful things I've been sent recently. Over Christmas I entered a number of Giveaways and Prize Draws and was rather lucky! Here is some of the stash I received. BTW you can see my mad carpet behind some of these prizes! This was the contents of a box which arrived from Dixie Samplar. I am slightly obsessed with other people's followers' numbers and love it when I become a "round number" follower, eg 50 or 100 or in this case 200. I said "Hi from follower 200" and Terri decided that was worth a prize! Wow! Look at this, Lizzie*Kate, a Red Alphabet by Sheepish Designs, 3 hand-wrapped parcels and not one but 12 Santas by Heartstrings. Just as I was wondering how I would stitch all those Santas (one large piece of fabric, 12 small, 3 groups of 4 etc) I opened the parcels and found the perfect 25 count fabrics. So that's decided for me, 2 groups of 6. 6 on each fabric. My Mum thinks some of them look like certain nationalities, there's a definite Scandinavian one and a Scottish tartan one so maybe that will make a fun blog game - spot the country! The little red, pink and silver things are the famous Hershey Kisses. I have heard of these but never seen/tasted them. I nearly didn't taste them this time thanks to the Large Boy but we have shared nicely. The most beautiful pillow, so nicely finished with grosgrain ribbon and a lovely button. This lovely chart was a prize from Kathy of A Stitcher's Heirlooms as part of her Twelve Days of Christmas event. It's called Noel Blanc. The little Prairie Schooler Tree is a bonus prize and perfect for the Christmas All Year Round blog's February theme (if I get a round tuit this month!). Isn't the card beautiful? The lovely green and red charm is a lucky Chinese jade charm and the Santa charts comes with five little Santa Charms too. I have gone from having no Santa stitching at all to having a plethora of charts to choose from! This cute reindeer is from Nia from Caixinha de Pirlimpimpim (which means Little Box of Pixie Dust in case you wondered!). It seems I commented and posted alot on her Christmas Party Giveaway so I deserved a little something despite not winning a "big" prize! This is a Jingly Bell Reindeer which had hubby and the postman wondering over the noise. He comes with a little bib to stitch one of the designs on but it covers the bell up so I might hang it behind him and just stitch Nia's name and the year as a reminder of where he came from. I've been coveting her Romantique Sampler (scroll down to the photos on this post to see it) for ages!! Apparently it's not quite finished yet so I have to wait to steal it see photos of it. Anyway Mouse kindly stitched me an excerpt from it on a piece of the same fabric beautifully finished into a pillow complete with pink ribbon and a lovely pearl-headed pin. See the tiny neat stitches - they were stitched at night by an actual mouse with a teeny needle. Mouse leaves her stitching out at bedtime with some thread and the mice come in the night and sew everything together (a little like the Elves and the Shoemaker). This is the only possible explanation for such perfectly neat tiny stitches! And finally, from Riona of Oubliette, I can Hear the Sea Call! Along with some lovely theads from ye Olde Willow Stitchery. They have lovely names like Byberry Township Green and Quaker Gold. I think they will be just right for the Mary Wigham Sampler which I am still considering. They are linen threads so maybe I need a piece of linen to stitch on? I have seen a lovely piece of fabric for the Sea Sampler on the Polstitches website. It's called Mystic and seems to be the perfect turquoise I want. I've not bought from Jo before (but with that name she must be good!) but I've heard great things about her fabric and she's very nice on the forums so I have no worries on that score. It's just that I feel slightly disloyal to the other two fabric dealers I usually buy from LOL! Does anyone else feel like that if you use a different supplier to usual? The bigger corporations don't bother me but since I've got to know the one-woman-bands well I want to put as much business their way as possible! 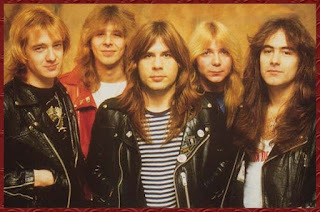 And finally, just for Michelle of A Stitching Love Affair here is a picture of some Real Men of Heavy Metal, not your American pretty boys LOL. This is the exact picture which adorned the back of my History folder throughout High School. You should check out Michelle's blog, she's stitching Enchantment of Winter and does post pics of that too, not just old rockers! edit - actually Michelle's in New Zealand so they are not technically her pretty boys. All she gets is rugby players and a few hobbits to call her own! ps How many times did I get "lovely" into this post? You've got some wonderful gifts there. Oh my, beautiful and fun winnings. The mice around here only seem to eat the bulbs and grass seed in the basement, I have never seen them pick up a needle or thread - maybe I should start a training program. I was Heart/Kiss/Floyd girl. But I do love Hair Nation on the XM! Congrats on all your good luck. At first I thought all those santas were Prairie Schooler designs. It will be so fun to see them all stitched together. What wonderful gifts, you lucky thing! Wow, haven't you been lucky! What great wins, congrats! Lucky girl! Have fun with all that new stash! Fun stuff! You got oodles of goodies! Congratulations on some great gifties!! What a lovely, lucky lady you are, Jo! @ Andie: Looove Karl Urban!! I count 12 "lovelys". :) Congratulations on all your wins. They are all "lovely". ;)Hee hee! Wow. What wonderful gifts you got. Congrats on all the wins. Wow, you got some wonderful goodies. Those santas are wonderful as is everything else! Wow!! BTW, there's nothing wrong with our American pretty boys, either!! It really was a lovely post! Great parcels lucky you. cool goodies! thanks for the mention! but I must say those sculpted muscled rugby players can't really compete alongside the likes of Bret Michaels, Axl Rose, Nikki sixx and DJ Ashba. LOL!!! Lots of lovely goodies - well deserved. You seem to be on a roll with the winnings, congrats. Super goodies that have come through your letterbox recently, how exciting. Lots to kep you busy, the Santa's are super, love them! Wow, lovely gifts. It's so exciting to get lovely parcels though the post! I'm glad to know that my little gift made you smile too :) Hugs to you sweetie!!! Jo I do thank you for becoming my 50th follower, if I had known about your obsession about blog follower numbers I would have made up a grab bag for you too. So now I will find the perfect thank you gift for you and I will need you address. Thanks again #50. Lol - reading your posts is like walking through an enchanted garden: you can't stop smiling and there are pleasant surprises at every turn. Congrats on the massive stash! Everything is just so beautiful I kept finding myself go "ooooh!" whenever I saw something.